Preheat oven to 450°F. 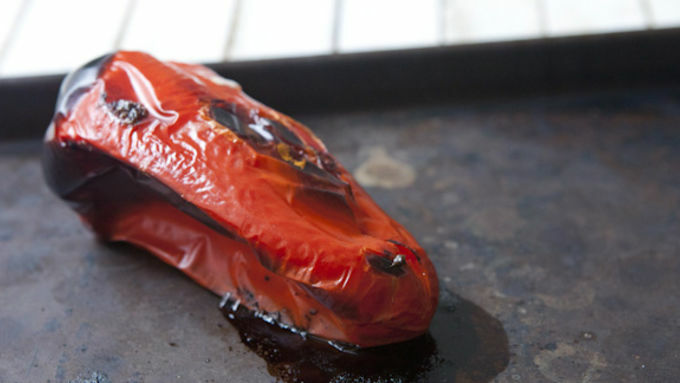 Roast red pepper on a baking sheet for 15-20 minutes, turning once until skin is very blistered and blackened. Remove pepper from oven and place in a bowl. Cover with plastic wrap and let steam for 5 minutes. 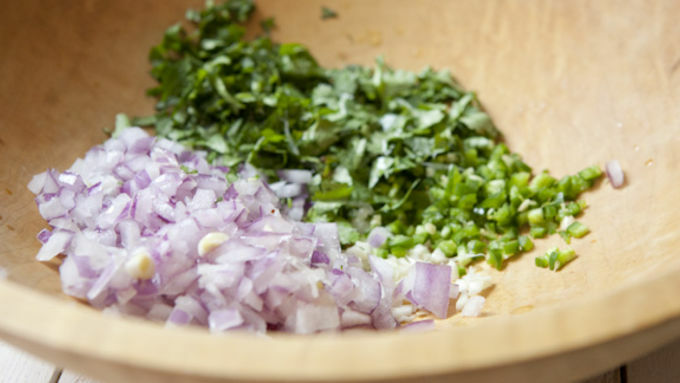 Meanwhile, add minced onion, garlic, serrano pepper, cilantro and lime juice in a medium bowl. Season with a pinch of salt. 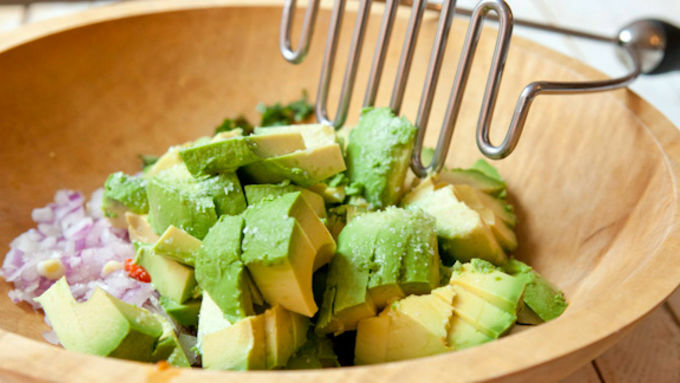 Cut avocados in half and remove seeds. Scoop soft flesh into bowl and mash together with other ingredients using a potato masher or large fork. After pepper has steamed, peel off skin and seed and dice the roasted pepper. Stir pepper into the guacamole. Season guacamole to your liking. It might need another pinch of salt or a squeeze of lime. 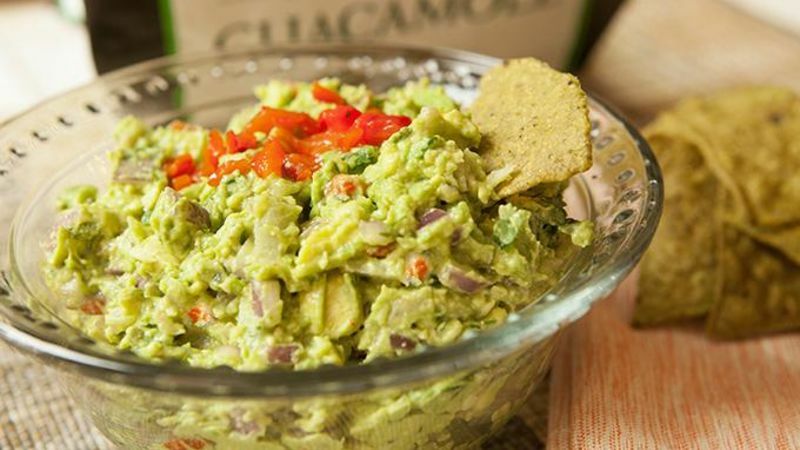 Serve with tortilla chips (like Food Should Taste Good™ Guacamole chips)! This guacamole starts out life the regular way, but adding roasted red peppers takes it to a new level. It’s a rare day that I mess with my basic guacamole recipe too much. At the end of the day, good guacamole is as easy as ripe avocados, salt, lime, and maybe some cilantro and peppers. Everything else is above and beyond. That said, I can say that my Roasted Red Pepper Guacamole is worth the extra ingredients. 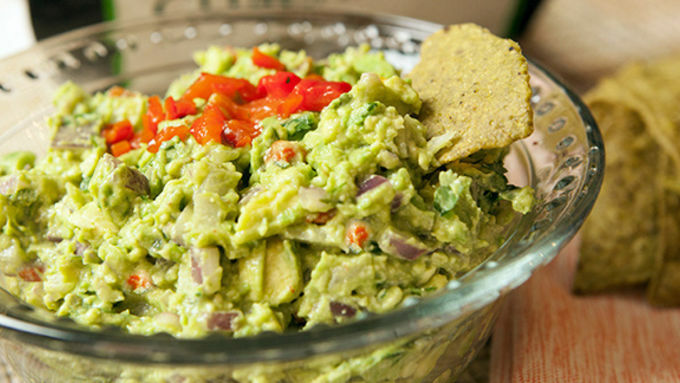 The roasted pepper adds a subtle, extra savory dimension to the guacamole. It doesn’t get in the way of the good flavors that people love, but it does give it a distinctly different flavor and some fantastic red color! You can buy store-bought roasted peppers that are decent, but they're also expensive. Roasting a pepper isn’t that hard. A few extra steps are totally worth it. I recently discovered Food Should Taste Good Guacamole chips, and they go well with guacamole! 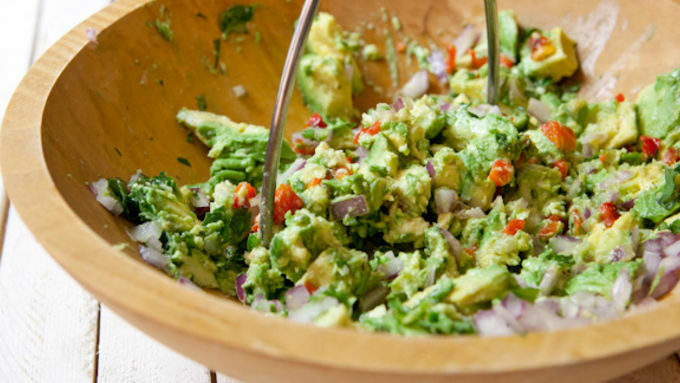 Most guacamole recipes are good, but this one is worth the extra work and is a bit different. Give it a shot!